Make your conference an event that people talk about months later. I partner with senior leaders to ensure that my Keynote is tailored, and syncs with the focus of the event. My speeches are designed to be interactive and encourage discussion to deliver lasting changes. Your delegates attend your events for many reasons, but being bored is not one of them. High Energy, Humorous, Insightful and Inspiring is my default approach for Keynotes. 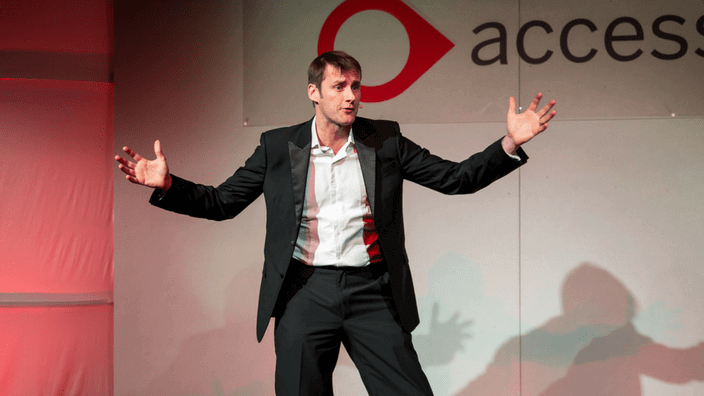 Each Keynote I deliver is tweaked to your delegates industry or area of interest. Senior Leaders often need help to get their team’s heads in the right place to move from where they are today to where they need to be tomorrow. I help leaders to ready their teams for a change, by designing and facilitating interactive meetings that focus on the way forward. A conference host is the oil that keeps all the moving pieces of a conference on track. Maintaining the theme through the day, keeping speakers to time and picking up the pieces if a speaker bombs, are all key skills when hosting a conference. I use my industry knowledge sprinkled with a little humour to make events go from good to great. Many business struggle to grow sales not because their product or service is poor but because they do not engage the whole organisation in the sales and delivery process. How to Define and executing a structured sales process. Building a strong relationship in advance of a client having a need is key to a sales professionals success. Whilst many sales professionals talk of becoming a “trusted advisor”. Yet translating a phrase into actionable strategies for sales success is harder than it looks. Aligning the Customer Buying Journey with the sales process. Inspiring high levels of performance is more than just KPI’s and an annual review. To achieve self-sustaining sales performance leaders need to inspire their teams to want to succeed for both themselves and the companies gain. Have something in mind, or just want to catch up, then just get in touch.